Note 1: When using an RS485 bus of substantial length, do not forget to use 120 Ohm termination resistors on both ends of the bus. •Each Bus Probe has a detachable terminal block with four terminals: ground (GND), power (+V), as well as RS485+ and RS485- lines of the RS485 signal pair. 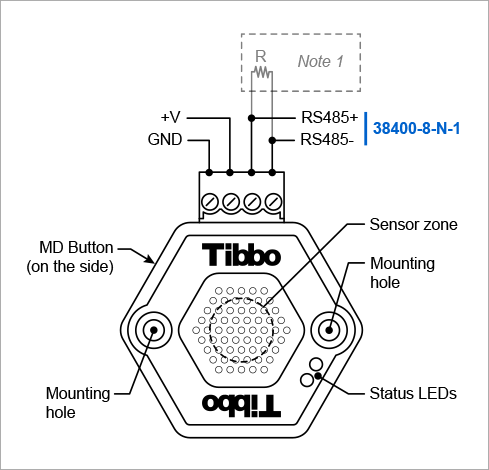 •Communications parameters of the RS485 port are 38400-8-N-1. •When using an RS485 bus of substantial length, do not forget to add 120 Ohm termination resistors on both ends of the bus. oFor entering the firmware update mode of the Monitor/Loader. •Status LEDs display a number of device states and errors. • Mounting holes can be used to attach Probes to flat surfaces.